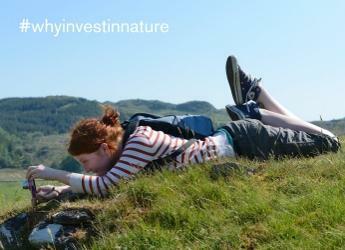 "We expect a selection of compelling films which will help us show how Scotland’s economy benefits from our wonderful natural heritage and make the case for all sorts of businesses to get involved in looking after Scotland’s nature"
Young filmmakers with a passion for nature are being sought for a new competition that aims to encourage businesses to see the benefits of the natural world. Scottish Natural Heritage (SNH) and the Scottish Forum on Natural Capital (SFNC), of which the James Hutton Institute is a member, have joined forces with business, education and the arts industry to offer young people the opportunity to share work inspired by Scotland’s nature. The short film competition is seeking entries that combine passion and creative talent with the latest facts to make a powerful case for why businesses should invest in nature. It aims to reinforce the message that as well as gaining customer loyalty and goodwill by being environmentally-conscious, businesses are also dependent on a healthy natural world, often relying on nature to provide goods and services. Entries will show that investing in Scotland’s natural assets benefits the whole of society by improving public health and well-being, with businesses an important potential source of innovative ideas to help us all live more sustainably. Films can use animation, imagery featuring Scotland’s natural capital, interviews or any other video material, and will be judged on how well they make the case for businesses to invest in nature, as well as creativity, innovation and attention to detail. A cash prize of £1,000 is on offer for the overall winner, with prizes of £500 for the top entries in the competition’s six categories. The Scottish Government's Finance Secretary, Derek Mackay, said: “Investing in Scotland's natural capital is fundamental to a resilient, low-carbon economy that benefits everyone. SNH Chief Executive Francesca Osowska said: “We’re delighted to be working with the Scottish Forum on Natural Capital and all of our partners in this our first film competition. David Wood, SFNC Deputy Chair and Senior Policy Director at ICAS, said: “The Scottish Forum on Natural Capital is delighted that this competition will highlight the importance of natural capital and the benefits to companies of investing in natural assets, for themselves and their broader stakeholders. The Why invest in nature? competition has the backing of Scottish Woodlands, Scottish Land & Estates, Baillie Gifford, Scottish Power, Robertson Construction Tayside, Speyside Wildlife, Creative Scotland and Young Scot. The competition is open to those aged 16-30 with a passion for film making. The competition is open from the 18 February to 31 May 2019. The winners will be announced in June 2019 with a prize ceremony afterwards. The winner of each category will receive £500, and out of these six winners we will also announce an overall winner who in total receives £1000. The winning entries will be screened at an awards ceremony and at business events as well as promoted online.